The Las Vegas Comedy Institute is offering more classes in the art, science and business of comedy. 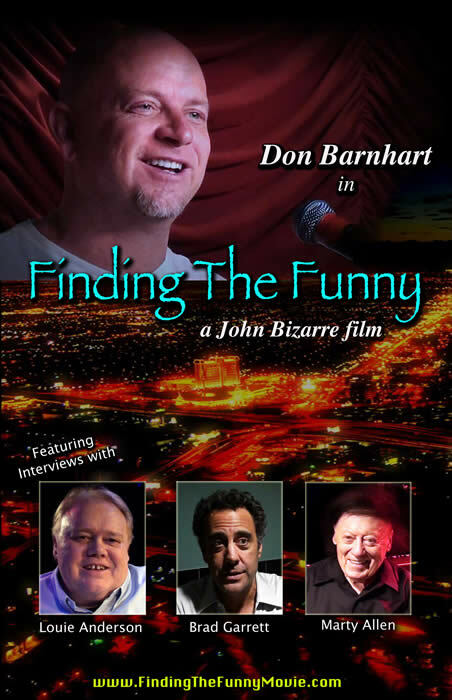 Finding The Funny is the documentary film directed by John Bizarre and stars award-winning comedian Don Barnhart, explores the process of becoming a comedian and whether it must always be an organic and accidental affair or if one can actually teach a person to be funny. Barnhart and Bizzare knew each other from working together over the years at comedy clubs and entertaining the troops overseas and this is the first collaboration between the two. It is a documentary exploring the merits of teaching a person how to become a stand-up comedian and a candid behind-the-scenes look at the process involved in supplying students with the tools they will need before they walk out onto the stage for the first time. In addition to following the comedy class, the film features candid and honest interviews about the plusses and minuses of comedy classes with Brad Garrett, Louie Anderson, Marty Allen, Wendy Leibman, Andy Kindler and many other comedians both famous and not so famous who share their thoughts on the arduous task of becoming a stand-up. Barnhart, who continues to headline the top comedy clubs nationally, got his start at The Comedy & Magic Club where he both managed and booked talent while pursuing his own stand up career. He has been teaching stand-up comedy in Las Vegas for many years and is consider by his peers as one of America’s premier comedy coaches.